As parents, we want the best for our children, and we also want our children to have the proper stimulation to promote development. One way of ensuring the proper stimulation for our children is to use toys and activity stations that encourage curiosity. When you are thinking of purchasing an activity station for your child, you want to make sure that it is an item that your child will enjoy for a certain period of time. You don’t want to buy something that your child is only interested in a cursory manner after which time; he abandons it for a more entertaining toy. 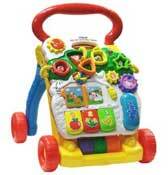 One activity station that your child will enjoy is the Bright Starts Around We Go Activity Station. It is also an activity station that is guaranteed to keep your child fully entertained as he continues to develop from baby to toddler. When you are planning to purchase any item for your child, it is a good idea to learn more about the company that has manufactured the product. Getting an idea of the company’s philosophy can give you a deeper understanding of whether the item that you are planning to buy is suitable for your child. The Around We Go is a product by Bright Starts, which is a part of the Kids II company. The philosophy that Kids II adheres to is that there is always a new way to bring a smile to a child’s face. With a philosophy like that, you can be reassured that any product from this company is created to bring as much joy to your child as possible. Another factor to consider when you are purchasing a toy for your child is whether the item comes highly recommended by other parents. It is even more reassuring when the activity station is the recipient of an award. The Bright Starts activity stations have been winning awards from the National Parenting Center Seal of Approval to the Creative Child Magazine Toy of the Year Award since 2005. When you take a look at the toys by Bright Starts, especially the Around We Go Activity Station, you can easily understand how it is a constant favorite of many parents. 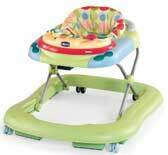 It is the only activity station that is designed to keep your child entertained from babyhood to toddler hood. 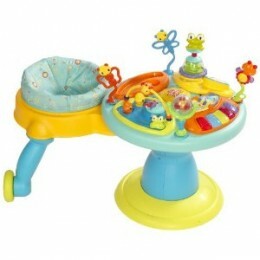 It features a seat that allows your child to explore the toy tray by rotating around the circular table. The toy tray features a variety of amusements that allow your child to develop an inquisitive mind in a fun and enjoyable manner. 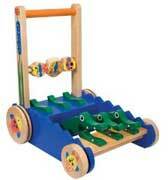 There are also three different modes of play to keep your child engaged. When your child progresses into toddler hood, you can easily remove the seat to convert the station into a toy table. 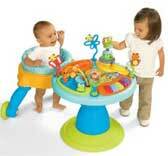 You can easily buy a Bright Starts Around We Go Activity Station from many retailers such as Wal-Mart, MotherCare or Toys-R-Us. If you prefer to make your purchases online, you should read these reviews at babywalkerreviews.com first. How would you rate the "Will Your Child Enjoy A Bright Starts Around We Go Activity Station? "?